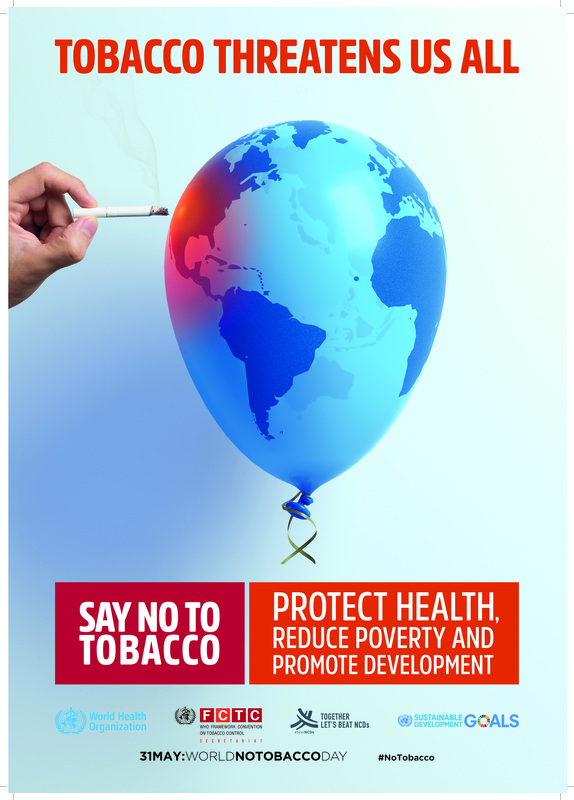 Tobacco is the leading preventable cause of death in the world. Tobacco control actions will prevent young people from starting to use tobacco, help current tobacco users to quit and protect non-smokers from exposure to second-hand smoke. In the African Region, 44 countries have ratified or acceded to the WHO Framework Convention on Tobacco Control. Strengthening the implementation of the convention is one of the big challenges for countries in the African Region. Countries in the African Region are experiencing an increasing rate of tobacco use. The fast growth of the population in Sub-Saharan Africa and an increase in consumer purchsing power is leading to larger and more accessible markets in Africa. In addition to that there are the intensive efforts by the tobacco industry to expand African markets. Prevention is therefore the most cost-effective measure. 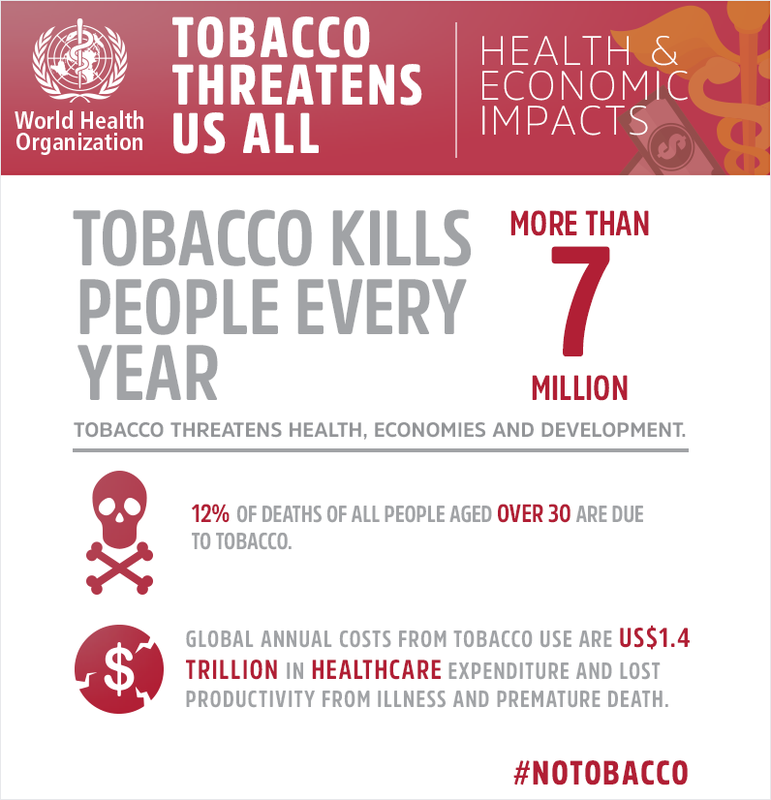 Comprehensive monitoring informs the governments and civil society on how the tobacco epidemic harms their countries, and helps them to allocate tobacco control resources where they are most needed and will be most effective. Tobacco control actions aim to substantially reduce the prevalence of tobacco use and exposure to tobacco smoke. 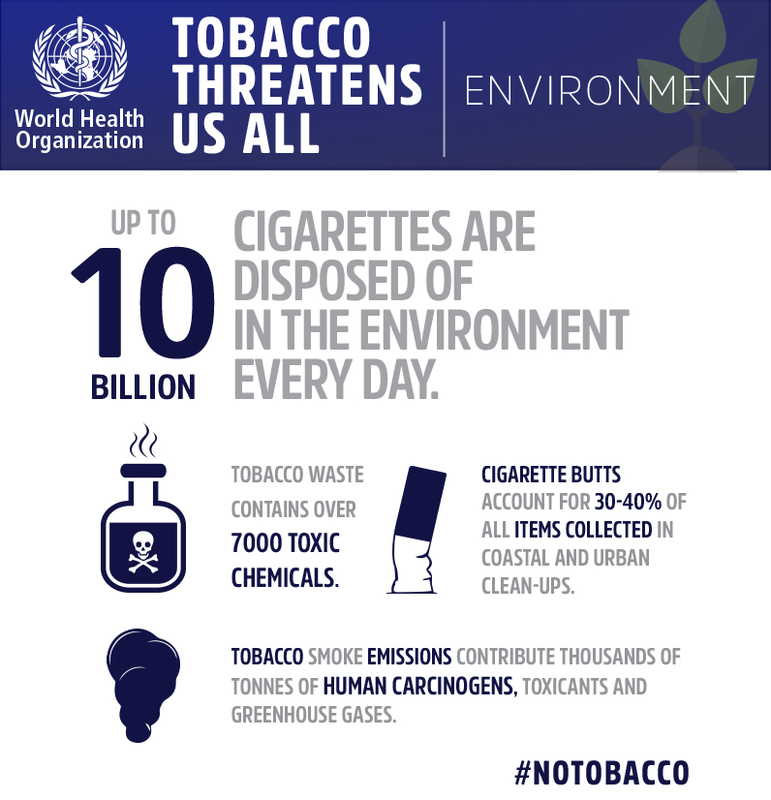 The Who Framework Convention on Tobacco Control (WHO FCTC) lays out different tobacco control measures to be implemented in order to prevent young people from starting to use tobacco, help current tobacco users to quit and protect non-smokers from exposure to second-hand smoking. Setting implementation goals and developing plans and strategies for the implementation of the Convention in the African Region are imperative. In addition, building the capacity of the Member States in the region for an effective enforcement of the different strategies is crucial. Mobilizing resources for national tobacco control programmes with the participation of nongovernmental organizations and the private sector. The country profiles were generated from data collected for the WHO report on the global tobacco epidemic, 2015. The country profiles provide information about tobacco prevalence, preventive measures, cessation and tobacco economics. The Tobacco Atlas is intended for readers interested in the effect tobacco has on health, politics, economics, big business, corporate behavior, globalization, smuggling, tax, religion, allocation of resources, poverty, gender issues, human rights, children, human development, and the future. This third edition of The Tobacco Atlas maps the history, documents the current situation, and predicts the future of the tobacco epidemic. The chapters illustrate that tobacco is not simply a matter of personal choice, but also involves a political and economic panoply of global social and demographic change, government policy, and corporate strategies, including tobacco industry activities such as smuggling, deceptive marketing, and evasion of corporate responsibility. This Atlas reflects the import-ance of multilateral approaches to reduce the epidemic, requiring action by the World Health Organization, other UN agencies, governmental and non-governmental organizations (NGO s), the private sector, and concerned individuals—in fact, the whole of civil society. 13% of young adolescent girls use tobacco products. Recent trends show an increase in tobacco use among girls. In the past, the prevalence of tobacco use among girls was lower than the rate for boys. But recent studies have shown the prevalence rate among girls (4.6% to 36.6%) has become as high as for boys (7.8% to 36.5%). 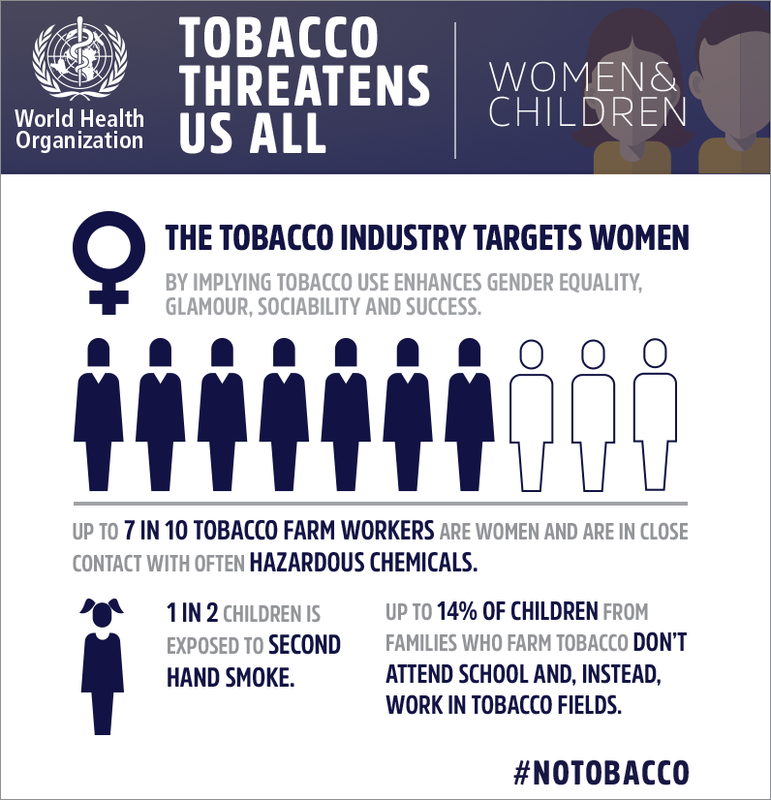 About 22,000 women die every year from tobacco-related diseases which are preventable. 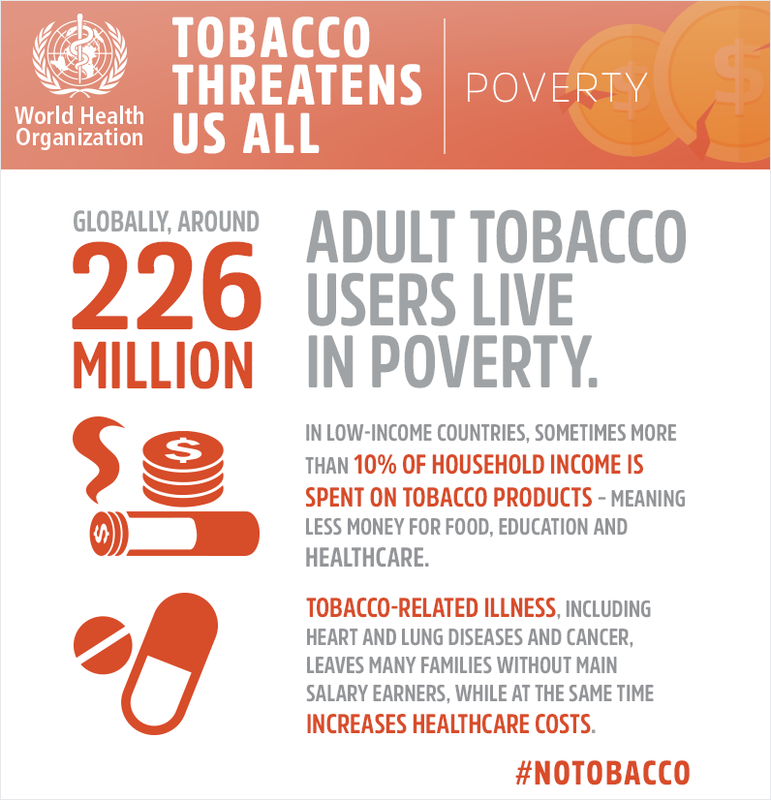 Between 2002 and 2030, tobacco-attributable deaths are projected to double in low and middle income countries (LMICs), including in Africa. Of adult deaths due to second-hand smoke, about 2/3 are among women (64%) – women working and living with men who smoke. In addition, women have unique and higher risks of cancer and artery disease. Tobacco causes similar health problems and threats for men and women. But women have unique and higher risks of cervical cancer, breast cancer, coronary artery disease. The Tobacco Control Programme contributes to the reduction of the burden of disease and death caused by tobacco through reducing the prevalence of tobacco use and the exposure to tobacco smoke in all segments of the population in the African Region. Tobacco control actions aim to substantially and continually reduce the prevalence of tobacco use and exposure to tobacco smoke.The WHO Framework Convention on Tobacco Control (WHO FCTC) lays out different tobacco control measures to be implemented in order to prevent young people from starting to use tobacco, help current tobacco users to quit and protect non-smokers from exposure to second-hand smoke.